Holmesburg is a neighborhood in the Northeast section of Philadelphia, Pennsylvania. Holmesburg was named for the descendants of John Holme (1632–1704) who immigrated to Philadelphia in the 1680s and had no known relation to Surveyor General Thomas Holme. John Holme's descendants acquired land in Lower Dublin, north and south of Frankford Avenue and west of the Pennypack Creek. At the turn of the 19th century they began selling numerous small parcels of their holdings in what became a real estate boom. Also at this time, John Holme, the great grandson of the first John Holme, renamed his lumber yard the Holmesburg Lumber Yard. This renaming coupled with the multitude of Holme family real estate transactions identified this area as 'Holmesburg', the title surviving more than two hundred years later. 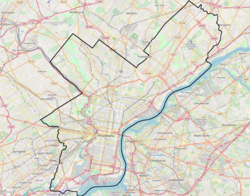 Holmesburg uses 19136 as its zip code. Holmesburg is the birthplace or residence of some of famous Americans, including Stephen Decatur (War of 1812 Naval commander), Matthias W. Baldwin (founder of the Baldwin Locomotive Works), Dr. Byrd Peale (a member of the historic Peale family and leading 19th century abolitionist), George Albert Castor (inventor of the ready-made suit that revolutionized the entire garment industry),, Civil War & Indian War leader General John Gibbon and actress Ethel Barrymore. Before the Act of Consolidation, 1854, Holmesburg had been a part of Delaware Township of Philadelphia County. Before 1853, it had been a part of Lower Dublin Township. Holmesburg contains one of the longest continuous African-American communities in the nation, having been founded by runaway slaves prior to and during the Civil War. Holmesburg is the location of the historic Pennypack Theatre building, built in 1929 in the Art Deco style with a 1,364-seat capacity and designed by acclaimed 20th century theater architect William Harold Lee. The Frankford Avenue Bridge and Joseph H. Brown School were added to the National Register of Historic Places in 1988. Recreational facilities include Holmesburg Recreation Center at Rhawn and Ditman Streets, James Ramp Memorial Playground, Pennypack Park and Pennypack on the Delaware. Transportation to Center City Philadelphia is provided by SEPTA's Trenton Line commuter train, which affords a quick 25-minute ride into the urban center. Interstate 95 is also an easy 10-15 minute drive into downtown, accessible either by the Cottman Avenue (PA-73) entrance to the south or Academy Road entrance to the north. Holmesburg's main thoroughfare, Frankford Avenue (U.S. Route 13), is a historic byway in use for centuries. Frankford Avenue was used as a route from Philadelphia to points north as far back as the 17th century. The Frankford Avenue Bridge across Pennypack Creek, built in 1697, is the oldest stone arch bridge in continuous use in the country. The Philadelphia Prison System is located in Holmesburg. It includes the Curran-Fromhold Correctional Facility (named for Patrick N. Curran, Warden of old Holmesburg Prison, and Robert F. Fromhold, Deputy Warden, both of whom were murdered in an attack by two inmates on May 31, 1973), the Detention Center, the Philadelphia Industrial Correctional Center, the House of Correction, Riverside Correctional Facility and The Alternative and Special Detention unit. Curran-Fromhold replaced Holmesburg Prison, which was used from 1896 until 1995. Holmesburg Prison was recently reopened. Acres of Skin: Human Experiments at Holmesburg Prison is a 1998 book by Allen Hornblum, which documents clinical non-therapeutic medical experiments on prison inmates at Holmesburg Prison from 1951 to 1974. The School District of Philadelphia operates Joseph H. Brown Elementary School in Holmesburg. Brown feeds into Meehan Middle School. All persons assigned to Meehan are zoned to Abraham Lincoln High School. Saint Dominic Roman Catholic church and grade school are located in Holmesburg. Father Judge High School is located in Holmesburg. Father Judge High School is a Roman Catholic high school. It was established in 1954 by the Roman Catholic Archdiocese of Philadelphia and is run by the Oblates of St. Francis de Sales. Lincoln was originally scheduled to be named Mayfair High School, but opposition from other neighborhoods, including Holmesburg, meant that the school was instead named after Abraham Lincoln. In 1949 the school's cornerstone was laid. The Free Library of Philadelphia operates the Holmesburg Branch. Holy Family University is planning on constructing buildings at the former Liddonfield Projects site. Private or independent schools in Holmesburg, Philadelphia include Holmesburg Christian Academy, which is affiliated with Holmesburg Baptist Church and includes a preschool, elementary school, and middle school. Holmesburg Prison was used for three major motion pictures, Up Close & Personal starring Robert Redford and Michelle Pfeiffer, Animal Factory starring Willem Dafoe, Mickey Rourke, and Edward Furlong, and Law Abiding Citizen starring Jamie Foxx, Gerard Butler, and Colm Meany. Parts of the movie Fallen were also filmed here. ^ Theresa Richardson. Acres of Skin: Human Experiments at Holmesburg Prison (Review) Canadian Journal of History, April 1, 2001. ^ "About Us." J. H. Brown Elementary School. Retrieved on December 10, 2016. ^ "Joseph H. Brown Elementary School Geographic Boundaries." School District of Philadelphia. Retrieved on December 10, 2016. ^ "High School Directory Fall 2017 Admissions" (Archive). School District of Philadelphia. p. 42/70. Retrieved on December 10, 2016. ^ "Holmesburg Branch." Free Library of Philadelphia. Retrieved on October 19, 2012. ^ "Academics." Holmesburg Christian Academy. Retrieved on March 08, 2017. This page was last edited on 15 February 2019, at 21:46 (UTC).